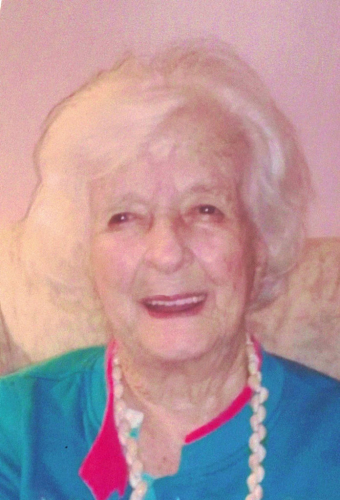 Carolyn B. Mueller, 102, of Palm Bay, Fla., and Pottsville, passed away Friday, March 15, at Schuylkill Center. Born in Philadelphia, June 27, 1916, she was a daughter of the late Jay and Caroline Lamb Bright. Carolyn graduated from Haverford High School in 1934, and attended Drexel University, majoring in home economics. She was a homemaker, real estate agent, and owned and operated a guest house, "The Belvidere," in Cape May, N.J., for 15 years with her husband, Bill, which was previously operated by her late mother. Some of her notable accomplishments include being employed by the federal government during World War II to teach home canning techniques, being active in the League of Women Voters, hosting former UN Secretary U Thant at a dinner in Lansdale and winning local awards for her landscape paintings. In recent years, she was an active member of the Pottsville Allied Artists. Carolyn enjoyed many activities, including painting, playing bridge, bible study, reading, listening to music, traveling, and spending time with family and friends. We will remember her warmth, her quick wit, her intelligence and her love of a picturesque, oceanside view. In addition to her parents, Carolyn is preceded in death by her husband, William G. Mueller, with whom she shared 64 years of marriage until his death in 1999; as well as her sons, Frederick and Robert Mueller. She is survived by her daughter, Carol McGuigan, wife of Bob, Pottsville; grandchildren, Susan McGuigan and Sandra O'Brien, Pottsville, Michelle and Monica Mueller, Seattle, Wash., Zach and Max Mueller, Newark, Del. ; six great-grandchildren; nieces and nephews. A memorial service will be held at 11 a.m. Saturday, April 13, at First United Methodist Church, Pottsville, with Pastor John Wallace officiating. Visitation will be held from 10 a.m. until the time of service April 13 at the church. Interment will be privately held at the family's convenience. At the family's request, memorial donations in Carolyn's name may be made to a charity of the donor's choice or to Habitat for Humanity. Checks can be made payable to Habitat for Humanity International and mailed to 322 W. Lamar St., Americus, Georgia 31709-3543.